British beef… wave the Union Flag, sing ‘God Save The Queen’ very loud and saddle up on one of the most mind-frazzling motorcycles ever built. Brit house builder/former plasterer/businessman (John Bloor) buys Triumph name in early 1980s, begins developing bikes in late 1980s and goes to the 1990 Cologne Show with a raft of modular triples and fours. Slowly and surely the firm becomes a success. And what a triple this is: by the time the bike was ready for launch, the motor was a 2.3 litre monster, the largest capacity production motorcycle engine ever, when launched to the public at the end of 2003. 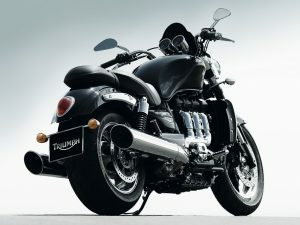 Named the ‘Rocket III’ this was a bike that just delivered a Big Daddy body-slam to your senses… It had a big, twin-headlamp stare, in front of that huge 25-litre fuel-tank under which sat that beast of a motor, positioned longitudinally. Yes, it did look like a bit of a cruiser, which (if you think ‘Virago’) meant a soft, friendly, cuddly bike: and yet the Rocket III was anything but. If the motor was the star, the soundtrack added to it: not much can compete with a Rocket III on open pipes, let us tell ya! Other co-stars emerge as you ride – like the brakes and handling. Often, on any cruiser, the brakes are a mere afterthought and take much forethought to get the (often heavy) machine to come to a halt. Not so the Rocket: brakes were 320mm discs and calipers straight off the Daytona 955i sportsbike of the time. Suspension was more than adequate too: 43mm Kayaba forks were specifically developed from the firm’s ‘sports’ inverted forks, while – at the back – such a modern look was eschewed for ‘classic’ looking twin shocks. Both did the business, because – while many cruisers wibbled and wobbled all over the shop – the Rocket III was predictable and purposeful in the corners, even if (of course) it would easily scrape a peg or two, but they would reassuringly fold-up when you did so. Weight: of course it’s got plenty of that – around 320 kilos dry and the more accurate 365 kilos with fuel and liquids aboard. Chuck in a chunky rider and that’s a lot of real estate to shift – but shift this thing does. 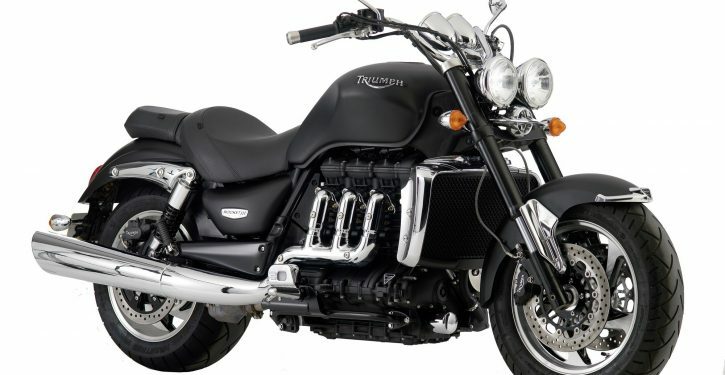 With a bike this hard to pigeon hole, it’s equally hard to stick it in a peer group – but we’d shrug and try something like Kawasaki’s VN2000 Vulcan, Honda’s grey-import Rune (1800 Gold Wing motor) and perhaps the Harley-Davidson V-Rod. For: Fun-factor and sheer physical presence! Against: Too big for the smaller amongst us and (as a naked cruiser) impractical. Verdict – big, brilliant and British!